Dog Eared Publicity is pleased to bring you Davison Kanokanga's MARRYING RIGHT Book Blast January 2 – 13! 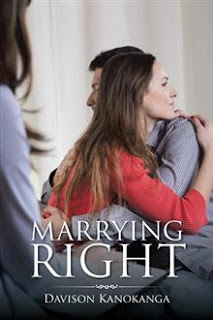 This book is for those who want to avoid the pain and misery of marrying the wrong person. It is a useful guide for spinsters, bachelors, divorcees, widows and widowers who are considering or might want to consider marriage. It is a useful tool for pastors, church leaders, youth leaders and marriage counselors. This book prepares you for marriage. It helps you to be a good candidate for marriage. It also equips you to be able to know what to look for in a potential spouse. Davison Kanokanga is a senior lawyer who practices law in Harare, Zimbabwe. He is the author of several books on love, marriage and relationships. He is also a radio and television personality, a marriage counselor, a preacher and a conference speaker. Davison and his wife Gwendoline are the founders of The Marriage Centre which offers pre-marriage and marriage counseling services as well as the senior pastors of Impact Christian Centre, a bible based church in Zimbabwe. Davison is giving away a $25 Gift Card!